Research shows that when patients ask a question, providing an answer they can understand is very reassuring. With this in mind, read over the following list of commonly asked questions. You may just find one that you’ve been wondering about. Good question. You brush your teeth twice a day at home and you floss. So why do you need a hygienist to clean your teeth two times every year? The answer is simple: nothing beats professional teeth cleaning. The hygienist uses a special rotating brush to thoroughly clean each tooth from the biting surface to the gum line. They also have handheld instruments to gently remove plaque and tartar that can lead to gum disease. Believe it or not, estimates are that more than 80 percent of American adults have some degree of gum disease. This bacterial infection has the potential to destroy your gums as well as the bone structure that supports your teeth. In fact, gum disease is a leading cause of tooth loss. And as if that weren’t problematic enough, the bacteria that cause gum disease have been linked to systemic illness, too, such as hypertension, cardiovascular disease and diabetes. 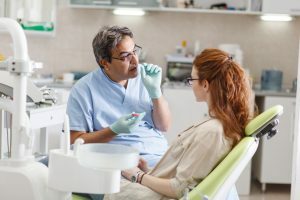 Should I Have Regular Fluoride Treatments? Most adults outgrow the need for regular fluoride treatments. However, if you are susceptible to cavities, then these can be very helpful. And fluoride treatments are certainly recommended for children. Kids often don’t do the best job of brushing their teeth, so fluoride treatments offer another wall of protection against tooth decay. The problem may be temporomandibular joint disorder or TMD. These joints hinge your jaw and skull together. You can feel them working if you gently touch the side of your face right in front of your ears and open your mouth. There’s a delicate balance of muscle, nerve, cartilage and bone here that can be thrown out of whack because of teeth grinding, arthritis or a hard blow to the face. Often, an oral appliance called a night guard can be worn while you sleep to alleviate the pain. Porcelain veneers revolutionized cosmetic dentistry. With these, a dentist can conceal the smile that Mother Nature gave you and reveal one that is perfectly beautiful. Made of strong dental porcelain, veneers are coverings that are bonded to the facial side of your front teeth in order to hide flaws such as chipped and broken teeth, permanently stained teeth, misshaped teeth and even teeth that are slightly misaligned. Dr. Chitra Naik is a respected dentist in Flint, MI. A graduate of the University of Pennsylvania School of Dental Medicine, she is a member of the American Dental Association, the Michigan Dental Association and the Genesee District Dental Society. She would welcome the opportunity to be the “dentist near me” you’ve been searching for. by: Dr. Chirta Naik at June 1, 2018 .